Section 8 of the American Housing Act 1937 lays out the rules for the Housing Choice Voucher Program and sets out Housing Quality Standards for landlords to follow. The US Department of Housing and Urban Development (HUD) created a program jointly with the US Department of Veteran Affairs called HUD-VASH under which the eligible homeless and at-risk US armed forces veterans receive vouchers worth $10,000 for renting out homes. Section 8 Voucher Program is a tenant-oriented rental assistance package which allows a tenant to move from a house that offers minimum level housing quality to another. Also, it makes it compulsory for owners to reserve either one or multiple units in their building to accommodate low-income tenants, and the government guarantees to compensate for the difference between the rent. Furthermore, landlords must fulfill housing quality requirements before renting their units. Fulfillment of these conditions is observed by the local Public Housing Authority while the conditions are referred to as HUD’s Housing Quality Standards. On paper the Section 8 based renting system seems reasonable enough as it provides low-income population some kind of stability and security. However, there are various unique challenges that landlords face when renting to Section 8 tenants. For some landlords, these challenges could even become potential deal breakers while for some these might be beneficial. 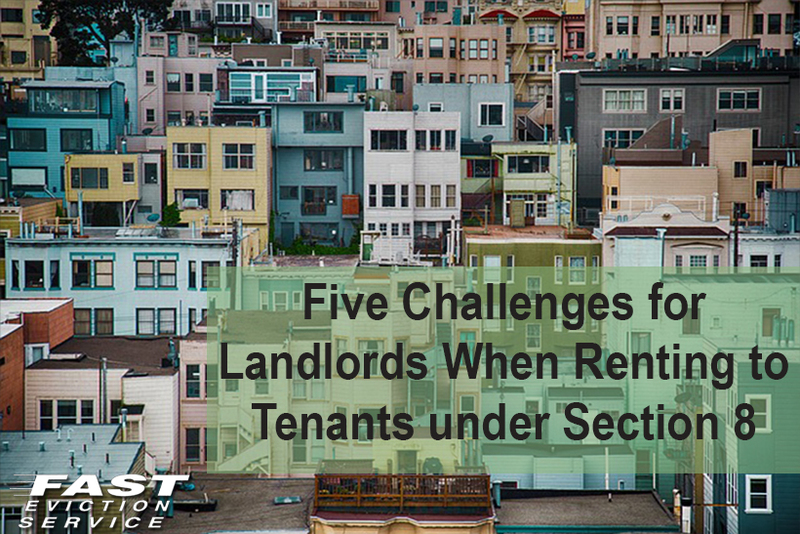 So, let’s find out the top five challenges faced by landlords while renting to tenants under Section 8 program. Under the Section 8 program, an inspector is required to visit the property at least once a year regardless if it is rented out or not. This is considered a major issue by the landlords as they feel confused because they don’t know when their rental unit will be inspected by the local Public Housing Authority. The purpose behind the inspection is to ensure that the property meets HUD’s Housing Quality Standards. The inspector will observe 13 areas to determine the status of your rental unit. These include the sanitary system, electricity supply system, water and sewerage, use of lead-based paint and smoke detectors etc. There are certain predetermined criterion for every inspected area; such as the sanitary system must be located at a private area in the rental unit and only the occupants of the home should use it. Naturally, for many landlords maintaining the house in a condition that the Housing Authority deems perfect is difficult at times and many fear to fail the annual Section 8 inspection. For instance, if there is hot water leak in the bathroom, the inspector will consider it a hazardous situation and might fail you. This is quite a challenge for the home owners. In case you are failed, the inspectors will give a list containing information about the areas or items that need attention and fixing. When all the issues are resolved, you will have to ask for re-inspection at the Section 8 office and an inspector will visit the property again to check whether the issues have been fixed or not. Under Section 8, landlords will receive payment by the Section 8 office after the tenant has moved into the rental unit. Given the administrative lapses and backups, many landlords have reported having to wait for three to four months before receiving their scheduled payment from the office. This is a big problem for landlords. However, once the first payment is received, then receiving follow up rents will remain consistent. Delayed payment is therefore, an issue of concern for landlords when considering renting to tenants with Section 8 vouchers. If you are not as financially stable to wait for a few months to receive rent then Section 8 program will be a bad choice. The Section 8 program offers housing vouchers for payment of the monthly rent on behalf of the tenant but these vouchers don’t include security deposit amount payment. So, if a landlord wants to keep the security deposit then the only option is to get it directly from the renter. However, it is not necessary that the tenant would pay the security deposit because usually the renters already have income issues, which is why they were deemed eligible for the Section 8 voucher program in the first place. If the tenants cannot pay security deposit then they have the right to appeal to other agencies for receiving the security deposit amount. Another issue in this regard is that landlords can collect an amount that has been determined by the state as the maximum security deposit limit. If you want to collect security deposit, then we advise you to not allow the tenant to move in unless they have paid you the require amount. Probably the biggest disadvantage of renting to tenants with Section 8 vouchers is that the property receives massive damages and wear and tear. Section 8 tenants tend to be very reckless and careless about the condition of the property and seldom attempt to maintain it. You must have heard several horror stories about tiles being broken, cabinets pulled off from their places, toilets being damages and overall bad hygiene conditions. This can happen to your property as well but it is also true that any tenant can cause harm to the unit not just Section 8 tenants. Good and bad tenants are everywhere so it is advised that you carry out appropriate screening of applicants prior to renting the unit. Renting to Section 8 tenants is challenging because landlords can expect to receive a certain amount as maximum rent under the Section 8 guidelines. Annually, HUD generates a list of Fair Market Rents for more than 2,500 locations across the country. This amount will be calculated according to the Fair Market Rent for your area along with the number of bedrooms in your rental unit. The housing voucher amount varies between 90 to 110 percent of the Fair Market Rent, which also depends upon the property condition and calculated rent for your area. Hence, you can expect to receive higher rent if you choose to rent to a non-Section 8 tenant. How Should A Landlord Deal With Collecting Rent From A Section 8 Tenant? To Section 8 Or Not To Section 8?